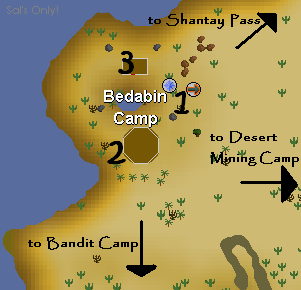 Welcome to the Bedabin Camp - an area located in the Kharidian Desert. 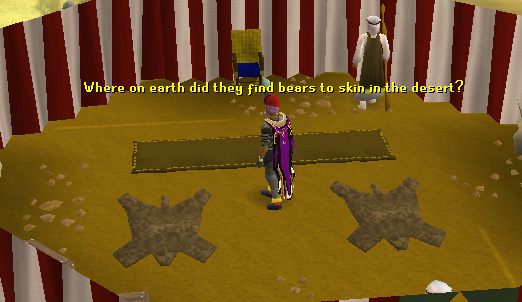 The far out camp is home to some interesting people, some helpful shops and is important in some quests! It is situated south west of the Shantay Pass in Al Kharid! In addition to these items, you need a Shantay Pass, which can be bought from Shantay for only 5 coins. A few extra coins are handy if you totally run out of gear. The easiest and fastest way to get to the camp is by a Magic Carpet. 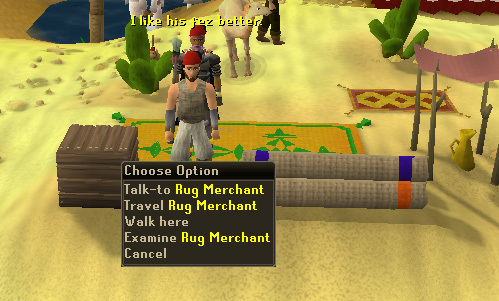 All you need to do is speak with the Rug Merchant near the Shantay Pass. The journey will cost a total of 200 coins, but if have a Ring of Charos (a), you can charm the Rub Merchant into letting you travel for 100 coins. However, if you complete the Rogue Trader Activity, the price of Magic Carpet travel will be reduced by 100 coins, making the default travel fee 100 coins. You can continue to reduce this to 75 coins if you wear the Ring of Charos (a). 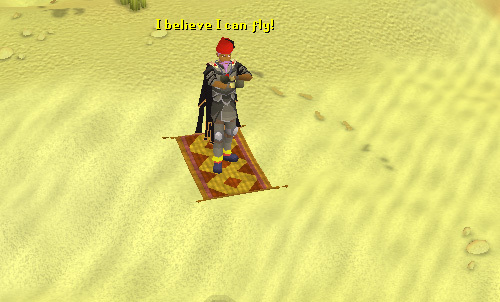 Riding the Magic Carpets used to require that you main weapon hand be free, and players were warned that they might encounter "turbulence" or that they might "hit a nasty flock of birds." 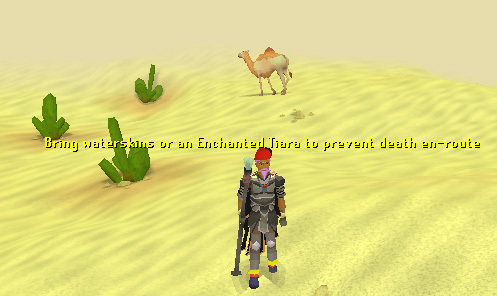 This has since changed, and you may now ride Magic Carpets while wielding a weapon. This is the slowest method. You will also need more waterskins for traveling on foot. When you've bought a Shantay Pass for five coins, enter the desert and walk south southwest for a while until you reach the camp. If you come across some Bandits you will have gone too far, so head north to get to the camp safely. Despite the Camp's small area, it has some interesting features. This is the place you'll arrive after taking that Magic Carpet. There is the Rug Merchant and the Archaeologist you start the Desert Treasure quest from. 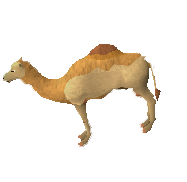 Sometimes you'll find a Camel wandering around the area. 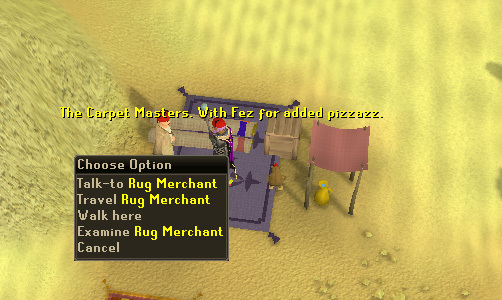 There is a crate you can search but it contains nothing, and also you can talk to the Rug Merchant's monkey if you have an Amulet of M'Speak from Monkey Madness! 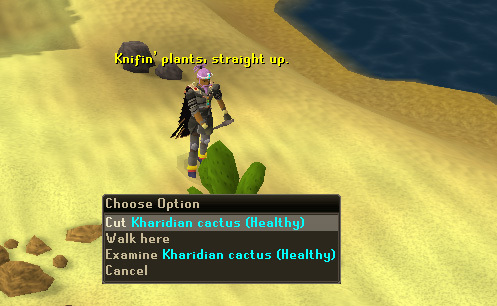 Also you'll find a Kharidian cactus that you can cut with your knife to refill your waterskins if you're running low. This striped tent is home to the Bedabin leader, Al Shabim, and some of his Nomads and Fighters. 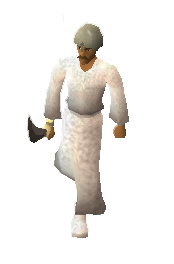 He is a main feature in the Tourist Trap quest. 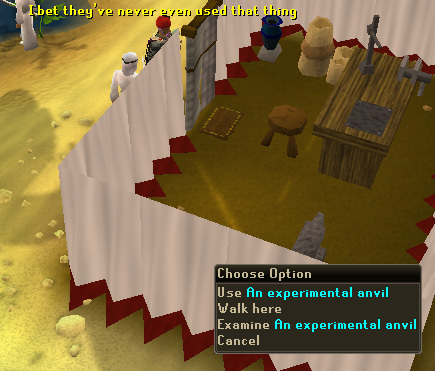 The use of this tent is for the Tourist Trap quest, where you smith the darts. It is only used once during the quest, and you need permission to enter. Dotted around the area are some Kharidian Cacti where you can refill your waterskins from. 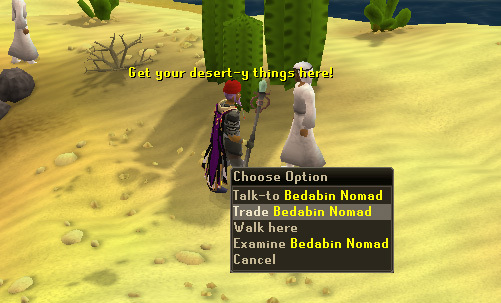 If you're stuck in the desert, with no water, and only a few GP, you can refill your supplies by trading any of the Bedabin Nomad NPCs (not the ones you can attack!). They offer many desert traveling items. These are all the NPCs you will find in Bedabin Camp. There aren't many monsters around the Bedabin Camp, but you will find the following monstersin the area.